Once I found out that I’d have a couple days to move (not just a single night and a couple hours), the Pantry Decimation Challenge I so eagerly started last month became much less of a priority. I wouldn’t be refrigerator-less, so I didn’t think I really needed to clean out my fridge or pantry. And then I moved, combined my food with S’s food, and realized that, whoa, we’ve got a whole lotta food, and maybe I shouldn’t have abandoned that Pantry Challenge so quickly. At the very least, I should’ve tried to finish off the irritatingly small amounts of various foods that were lurking in my cupboards – the dregs of a bag of soy curls, a barely-filled jar of arborio rice, that sort of thing. But it’s not too late. S and I are trying to use up those random bits of food as we hold off on purchasing pantry staples. So last Saturday night when I was in charge of dinner, I forced myself to use pantry goods only. After poking around in the shelves brimming over with pasta and spices and beans, I concocted what turned out to be a very delicious meal. Put the dried mushrooms and TVP in a bowl and cover them with stock. Set them aside to soak and rehydrate as you prepare the risotto. In a small pot, add the rice and stock. For the stock, you probably want to start with 1.5 the amount of rice – so, if you use ½ cup of rice, add ¾ cup of stock. 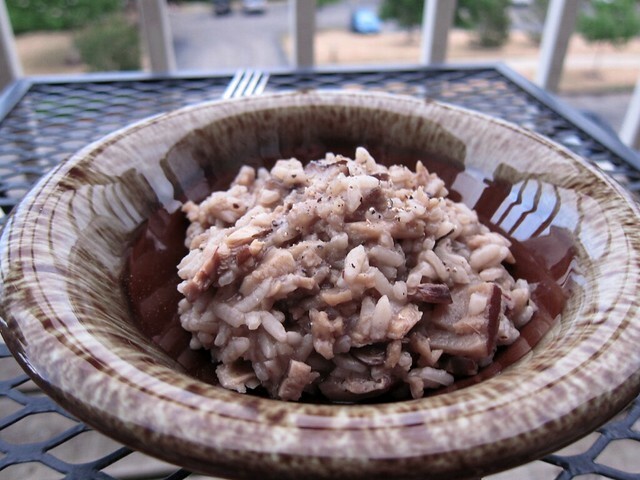 (I don’t bother to measure the liquids for risotto, though – the goal is to keep adding stock as the rice soaks it up.) Bring the liquid to a boil and then turn it down to medium-low – keep it simmering, but not boiling. Stir it frequently to ensure that no rice sticks to the bottom, and add more stock as necessary. After you’ve got a good handle on your risotto (about when you’ve first turned it down to medium-low), heat some Earth Balance (or olive oil) in a small saucepan on medium and add the diced onion. Sauté the onions until they’re translucent, giving them the occasional stir in the pan. In the meantime, don’t forget your risotto! Check your TVP and mushrooms. When they’re hydrated and the onions are translucent and fragrant, add the mushroom and TVP mixture (broth and all) to the saucepan with the onions. Depending on how thick your mushrooms are cut, they might take a little longer to hydrate. I added mine when they were soft to the touch. Add your spices, too. Keep stirring that risotto and adding broth as you sauté the onions, mushrooms, and TVP. After you’ve been cooking the risotto for about 20 minutes, give it a taste – the rice should be soft and creamy, not terribly chewy. Test your mushrooms as well – you want them to be soft too. Remove the risotto from the heat when it’s done. Add the onions, mushrooms, and TVP when they’re ready and stir everything to combine. Taste and add salt or freshly ground black pepper if necessary. Enjoy! What’s your risotto-making technique? What’s your favorite use of dried mushrooms (we’ve got a ton!)? I never have tried cooking risotto! See you soon!